No matter what industry you work in, setting up best practices for inventory management can be the optimum way to streamline processes and ensure efficiency in the supply chain. Unfortunately, creating those best practices can often feel like too much of a chore, regardless of the benefits that would follow. However, creating best practices for your warehouse and inventory management team goes beyond creating efficiencies “in the now.” It also improves customer satisfaction and retention, saves money in the long term, and can help you catch and prevent errors or mistakes that could land your business in hot water during tax season. But in what other ways do best practices improve inventory management? Let’s dive in and find out. Best practices keep employees safe. All warehouses are subject to Occupational Safety and Health Act (OSHA) laws, and creating a safe environment for employees that places an emphasis on best practices to avoid injury can help any and all warehouses stay compliant with federal laws. Yet compliance is not the only incentive for warehouses when it comes to creating safety measures. Employee safety is also good for business, as it places an emphasis on the importance of employee health. When businesses and warehouses treat their employees with respect and care, employees are more likely to feel valued in their position. This, in turn, can lower employee turnover, improve employee engagement, and foster a more positive relationship between the company, employees, and even customers; especially those customers who are invested in supporting a more ethical supply chain. As OSHA says on their website: “Safety is good business. An effective safety and health program can save $4 to $6 for every $1 invested. It’s the right thing to do, and doing it right pays off in lower costs, increased productivity, and higher employee morale.” Additionally, they point out that accidents and injuries can add up in costs faster than many businesses realize, and having to replace injured or ill workers can cause businesses and warehouses to fall behind in their goals. Forklifts: Forklifts are a common cause of injury, dismemberment, and death in warehouses. Ensuring that all employees know how to properly operate and maneuver a forklift can help prevent forklift turnovers. 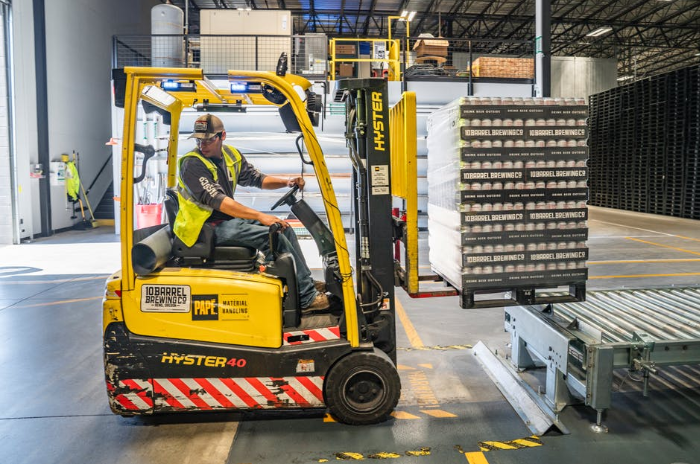 Additionally, ensuring that employees never exceed 5 mph, drive carefully in congested areas, and are aware of clearances in aisles where forklifts are used can help protect employees using the forklift and those on the ground. Hazardous Chemicals: Another common cause of injury in warehouses is hazardous chemicals. Establishing protective measures (such as cleaning guidelines and protective gear), as well as safe handling and storage of hazardous materials can help employees remain safe. Additionally, employers should ensure spill-cleanup kits are up to date and easily accessible, and there should be clear guidelines on what to do when a chemical spill occurs. Proper Tagging: Another example of the importance of communication in the warehouse is when tagging “out of service” equipment. OSHA commonly cites warehouses that do not use the tagging system properly, as employees aren’t able to properly assess what equipment is damaged or in need of repair. Tags should be made out of sturdy material and be easy to read, with explicit communication that outlines or identifies the hazardous conditions. Safety Equipment: Finally, another common cause of injury is falls in warehouses — whether through tripping hazards or not properly utilizing fall restraints, such as guardrails or harnesses. Employees should always be required to utilize safety equipment, and employers should ensure that their equipment is checked regularly, making sure it is up to code and functioning as intended. The same inspections should be applied to personal protective equipment, as well. “Inventory metrics” is an all-encompassing term that involves accuracy in inventory, turnover, fulfillment, employee productivity, and overall customer retention and satisfaction. Another essential step in setting up proper best practices is to ensure your inventory metrics are satisfactory for your business and that you’re properly tracking everything in your warehouse. Tracking inventory metrics can help provide deeper insight into how your business is performing and can highlight areas where improvement is needed. Without proper tracking, you may not notice some of the shortcuts being taken or other areas where inventory shortfalls are occurring. Over time, your business will start to lose money, and you’ll have to start from scratch to discover where the hole is and how best to fix it. Create Goals: Set business goals that align with your overall mission or set of values. Make sure these goals take into consideration such things as customer retention and satisfaction, growth, and profit margins, as well as other essential goals (financial or otherwise) that pertain to your business or industry. You can even set separate short-term goals and long-term goals. Define Metrics: Next, define the metrics you want to track and match them to the goals you created in the first step. These metrics will help you track your progress and ensure you’ve achieved any short-term or long-term goals. For example, if you intend to keep popular inventory in stock during a particularly busy season (such as the holidays), you may need to set up a proper inventory management system that can help you track overall sales and help you follow inventory in the supply chain. Communicate Expectations: Finally, and most importantly, communicate these metrics and expectations to all employees in the warehouse. Without proper communication, employees will not be aware of how to maintain the metrics you set, and you may find the same issues popping up again down the road. You can also ask your employees to interject their recommendations for the best way to ensure that metrics are met. Since employees are the ones working on the ground in the warehouse, they may have a better idea of how to streamline fulfillment processes and other essential functions. Take their advice and use it to further develop any metrics you’ve set, and then communicate all expectations to your staff. As mentioned above, inventory management systems can help you reach your intended inventory metric goals, as well as ensure that money isn’t being lost across the supply chain. When shopping around for an inventory management system, be sure to ask yourself some questions to help you narrow down what system fits best with your business. An effective inventory management system should be accessible and easy for you and your team to understand, and it should fit within your budget. Additionally, the best inventory management systems should allow for business growth, which means including additional tracking features for when your business starts to increase in sales. Finally, the system should reflect the results that matter the most to your business — whether that’s customer retention, overall sales and profits, or a mix of both. Finally, when it comes to setting up best practices, one of the most important things to remember is to regularly analyze your metrics, OSHA compliance, and other practices to ensure efficacy and update them as needed. One of the only constants in life is change, so adapting to that change through updated practices can help employees both now and in the future stay safe and productive. This is especially pertinent within the supply chain, as new technologies are constantly changing and adapting the way in which businesses manage inventory and shipping. Automation, the growth of ecommerce, and so many other external factors can influence the way a business runs its internal operations. Businesses should forecast, prepare for, and properly adapt to these changes as they begin to shape the future of work within the supply chain and warehouses across different industries. Although every industry and warehouse is different, regularly checking in with vendors, suppliers, and others within the industry can help you stay on top of the latest news, developments, and technologies. In general, constant communication is always a best practice — both between the warehouse and vendors, as well as between the employer and employees — especially in relation to changing standards and adapting practices. Once you’ve set up your inventory metrics, safety protocols, and other best practices, be sure to regularly check for updates that may pertain to your business. If OSHA releases new safety protocols or guidelines, be sure that all of those changes are communicated to the staff. Additionally, if new technology changes the manner of inventory tracking in your warehouse, be sure to adapt accordingly by analyzing how it influences your metrics and other business operations. Over time, checking in and adapting to change will almost become second nature for your business.